What does your customer want? Satisfaction! How do we ensure that? Customer Service! Customer Service has always been recognized as the key to business success and is now the most talked about issue in boardrooms across the country. As we all know, the role of those responsible for delivery and management of Customer Service is vital. #ShopCambridge. Shop Local. Through this campaign, local businesses are empowered to encourage customers to shop locally and support locally through distribution of materials and awareness. In order to support shopping locally, awareness of this campaign through the WOWCambridge awards, ensures that local commerce is a priority in the minds of consumers in the region. More of your money will be kept in your local economy. For every $100 you spend at locally owned businesses, $68 will stay in the community. What happens when you spend that same $100 at a national chain? Only $43 stays in the community. You embrace what makes your community unique. You wouldn’t want your house to look like everyone else’s in the Canada. So why would you want your community to look that way? You create local jobs. Local businesses are better at creating higher-paying jobs for your neighbors. 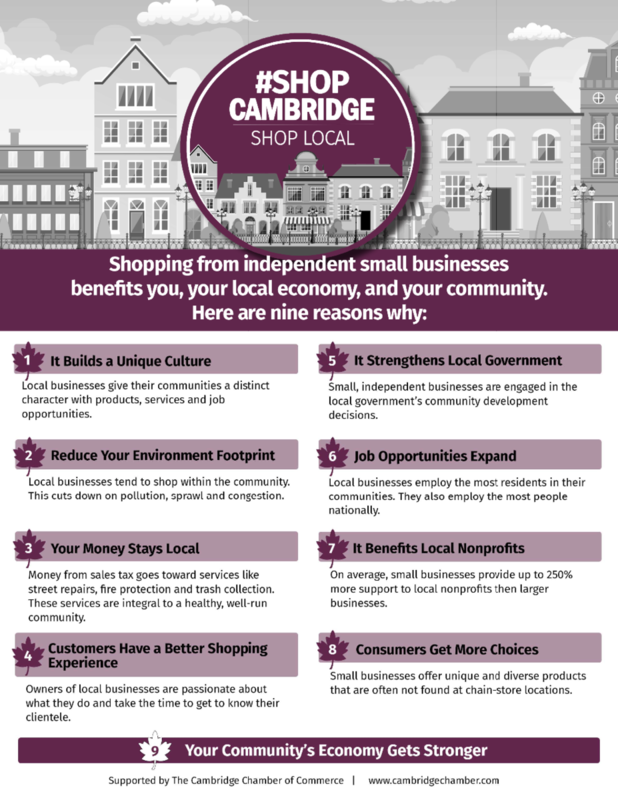 When you Shop Local, you help create jobs for teachers, firemen, police officers, and many other essential professions. You help the environment. Buying from a locally owned business conserves energy and resources in the form of less fuel for transportation and less packaging. You nurture community. Local business owners know you, and you know them. Studies have shown that local businesses donate to community causes at more than twice the rate of chains. You conserve your tax dollars. Shopping in a local business district means less infrastructure, less maintenance, and more money available to beautify your community. Also, spending locally instead of online ensures that your sales taxes are reinvested where they belong— in your community! You create more choice. Locally owned businesses pick the items and products they sell based on what they know you like and want. Local businesses carry a wid­er array of unique products because they buy for their own individual markets. You can take advantage of their expertise. You are their friends and neighbors. Locally owned businesses have a vested interest in knowing how to serve you. They are passionate about what they do. Why not take advantage of it? You invested in entrepreneurship. Creativity and entrepreneurship are what the American economy is founded upon. Nurturing local business en­sures a strong community. You make your community a destination. The more interesting and unique you community, the more we will attract new neighbors, visitors and guests. This benefits everyone! Here are the benefits of providing great customer service. To raise business community’s awareness of the importance of good customer service. To encourage development of customer service skills and professional growth. To encourage business to incorporate “customer service” as a core component for growth. To promote and encourage “Shop Locally First”. To encourage business to utilize customer service recognition to promote employee loyalty, employee pride, and exceptional company morale. To promote customer loyalty, and the customer “WoW” factor. To assist employers in motivating staff. To help businesses get and showcase positive customer feedback. To create a consistent positive community image. To build a customer care community that will inspire and attract new business. To build a strong community, customer service education program through the Chamber, and build awareness and facilitation of improved customer service. Stimulating repeat business increased profit, additional employment and an enthusiastic workforce that will build a strong and vibrant local economy. 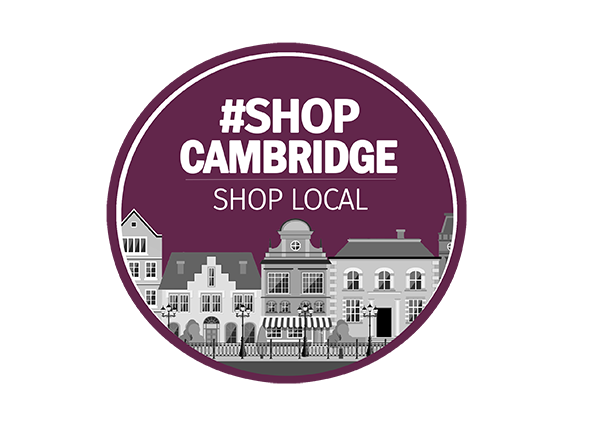 Feel free to display the #ShopCambridge #Shop Local flyer, logo or hand out some post cards. Help us raise awareness through social media. Have you met someone who went out of their way to provide you with outstanding service? If so, we want to recognize that individual whose service went above and beyond what is traditionally expected. Please take a moment and tell us about your experience and the person you wish to nominate for a WOW Cambridge Award.